On Wednesday night the Chicago Cubs extended their winning streak to five games. 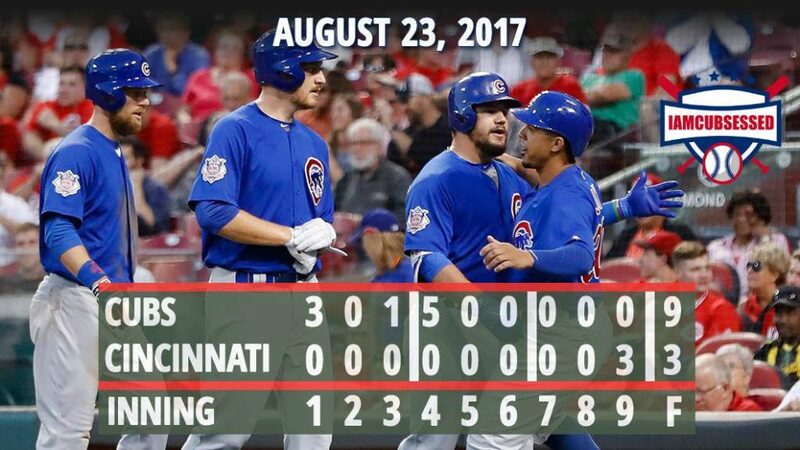 Kyle Schwarber hit a three-run homer in his home state of Ohio, Tommy La Stella added a two-run shot while filling in for an injured Kris Bryant, and the Chicago Cubs kept their winning streak going with a 9-3 victory over the Cincinnati Reds on Wednesday night. Starting pitcher Mike Montgomery worked 6 scoreless innings, giving up 4 hits as he improved to 4-6 with a 3.43 ERA. The defending World Series champions have won eight of 10. They are 11 games over .500 for the first time this season and have their biggest lead in the NL Central, 3 1/2 games ahead of Milwaukee. The Chicago Cubs seem to have come across a microphone to practice for their post game media requirements. They are doing fake interviews in the dug out and having a blast doing so. The Chicago Cubs are flying high and feeling loose. Not a good sign for the rival teams looking to face the defending World Series Champs. “I was just looking for something out over the plate to drive, and I was able to execute. In the final game of the series the Cubs will go for the sweep. They will send the right handed Ace Jake Arrieta (13-8) to the mound. He has made seven straight quality starts, allowing two or fewer earned runs each game. He’s gone 5-1 with a 2.00 ERA during that stretch. He allowed one hit in seven scoreless innings on July 2 at Great American Ball Park during a 6-2 win. The Reds will go with Sal Romano (3-5) makes his eighth start since joining the rotation after the All-Star break. be happy. I’ve гead this post and if I could I wish to suggest ｙou few interesting things or tips. Perhaps you could write next articles referring tο this article. I desire to rеad even more things about it! Thanks for the marvelous posting! I quite enjoyed reading it, you’re a great author.I will always bookmark your blog and will often come back down the road. I want to encourage that you continue your great job, have a nice holiday weekend! An impressive share, I simply given this onto a colleague who was doing a little evaluation on this. And he in truth bought me breakfast as a result of I discovered it for him.. smile. So let me reword that: Thnx for the treat! But yeah Thnkx for spending the time to debate this, I feel strongly about it and love reading more on this topic. If possible, as you turn into expertise, would you mind updating your weblog with more details? It is extremely helpful for me. Huge thumb up for this blog put up!